I just wanted to wish everyone a very Happy Thanksgiving. We will be spending the day with my parents, eating turkey and all of the fixings, watching the Macy's Thanksgiving Day Parade. We will probably DVR the Dog Show and we will watch football. It will be a fun day. Have a great one! It is time for Tuesday 4 Meme! 1. Do you read an actual print newspaper? If so, how often? : no. My parents do, but I never have read the newspaper. I will check out the Black Friday ads though. 3. Do you believe that it's possible for the media to be unbiased? : no way and it gets really old. 4. Who's your favorite TV News Reporter/s? I just listen to local news. Every now and then I will watch National News. I did last night for the Ferguson reports and then switched to Fox News. Today we had a half day at the preschool, so I chose to have us decorate for Christmas. We are done now until next Monday. I still have lesson plans through January from working over the summer, so decorating seemed like something fun we could do. The picture on the right is our front door. 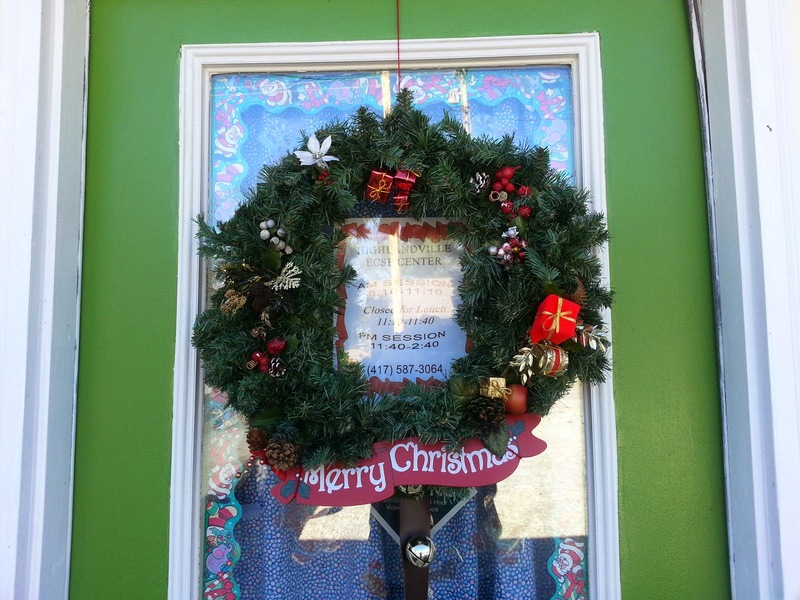 The picture below is our window to the right of the front door. 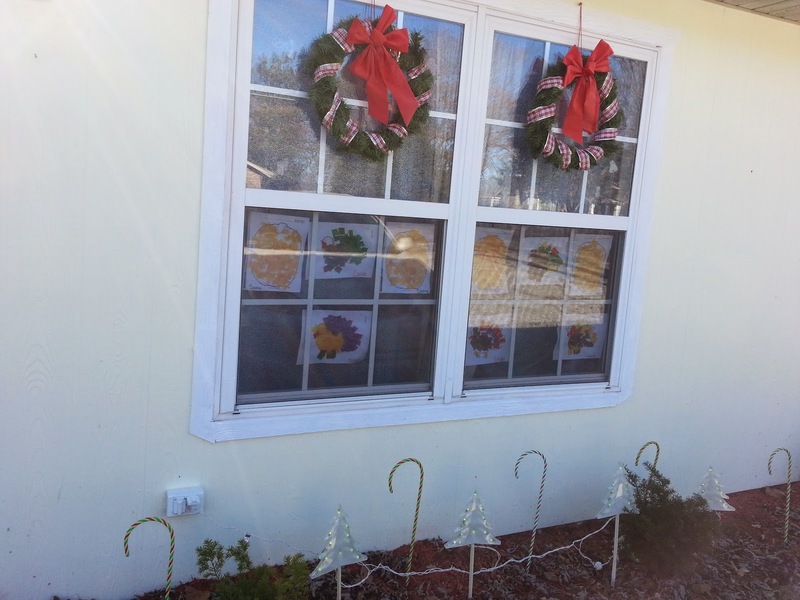 We have another window to the left and it also has a wreath on it. The little trees on the ground light up and there candy canes between each tree. We had fun decorating and the kids enjoy it. Josh has Sylvan tutoring tonight. It is helping his grade a lot. He is also trying to work on his other grades in his other classes. I am not sure what has happened to him, but his grades are just not as good as they have been in the past. Tomorrow I will make a pumpkin pie for Thanksgiving. We will be going to my mom and dad's house and my mom has most of it in control. I will help her once I get there, but I will get this pie done ahead of time. Today is actually her birthday. I will call her, but we celebrate on Thanksgiving. She was actually born on Thanksgiving. I hope you are all doing well. 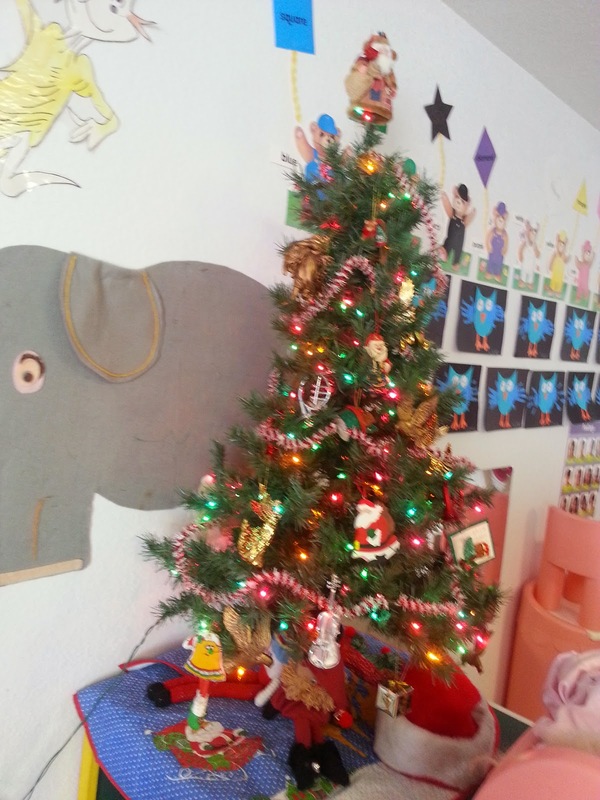 I will post one more picture of the little Christmas tree we put up in the classroom. Here is the Thanksgiving Card from Toni!!! Thank-you Toni! It is time for Tuesday 4 Meme!!! Josh is at tutoring tonight and he has one of those fake babies that cries for his child development class, so I stayed home to "babysit" it. Karl and I usually shop while he is at Sylvan, but I would probably get some strange looks if I was carrying around a fake baby. hahahaha. So I thought I would get my post in. So we have almost made it to Thanksgiving break at the preschool. We have class on Monday and then Tuesday we work a half day with no kids and we are off the rest of the week. We are going to get it decorated for Christmas that half day, so when we come back, the kids will have a nice Christmas classroom to enjoy. I am excited for Thanksgiving. I love that holiday. We will be spending the day with my parents. I guess I better get off here before the baby starts crying...LOL!!! Have a nice weekend. 1. Earthquake...you answer? I read there was one today here in the midwest, but not sure where. 2. Peaceful Lake...you answer? I wish I were there. 3. Chocolate Cake...you answer? Yes, please!! 4. Snowflake...you answer? We may see some soon. Well last Tuesday I had to go to the doctor. They tested me for strep, but I just had an upper respiratory viral infection. I had a horrible cough and sore throat. I cannot seem to kick it. If you are reading this, if you would say a prayer for me, I would appreciate it. I had to take a few fays off work last week, I was also running a fever, but went back on Thursday. I just have the lingering cough and still a sore throat now. Josh is doing well at Sylvan. It will be an ongoing thing, but he really did not want to go at first and now he is ok with it. It is cold here, in the 30's. Normal temps are in the 60's. They are calling for snow this weekend. Well, I better go. I hope you are all doing great. How is everyone doing? I feel like I have fallen off the blogging earth again. We have decided to put Josh in tutoring at Sylvan. The new common core subjects are a little hard and he is just not keeping up with Math, so he is getting tutoring for Math and also homework help. He goes on Tuesdays and Thursdays and is there from 5-7PM. It is in Springfield, so Karl and I usually run errands while he is in there. He is signed up for the rest of the year. We had him at Sylvan for reading when he was little and really liked the results. I think he likes it too. Besides Sylvan, I have been keeping busy with work and have been very tired at night. How was Halloween? It was cold and quiet here. We did not have as many trick-or-treaters. I am not sure if it is because it was so cold or if everyone was doing something totally else since it was on a Friday. Many of my former students from the preschool dropped by and it was good seeing them. I decorated for Thanksgiving around 9PM Halloween night, so that was done. I hope everyone is doing great. Have a nice week.